When meeting Molly Downey, Minford’s River Days candidate, you immediately find a very special young lady with a strong heart for others. Downey’s event was called.,”P. E. A. R. L. of Hope and it was held on May 11. Downey continued, “Everything I did, was with money raised, I did not have to take anything out of my pocket. The event was like a dinner/discussion and the first speaker, McKinney, spoke on the letter P. and then he blessed the food. Smokin’ Joes made the food, so everyone had a big meal, then there was a silent auction and there was an amazing turnout and I think I raised over $1,500 at the auction. There were over 150 people at my event, every seat was full. I also, got donations from people out of town, like COSI and Alabama Theatre, just to auction off and the proceeds go to the kids in our county. That money went back to the Bear Hug Effect. I collected over 50 backpacks on my own, I went and spoke at some churches and they donated them and I even collected diapers and strollers, because I was really impacted, when we went to get my little sister, they only had a blanket and a crib, but by the time we got home our porch was full of items from our community. 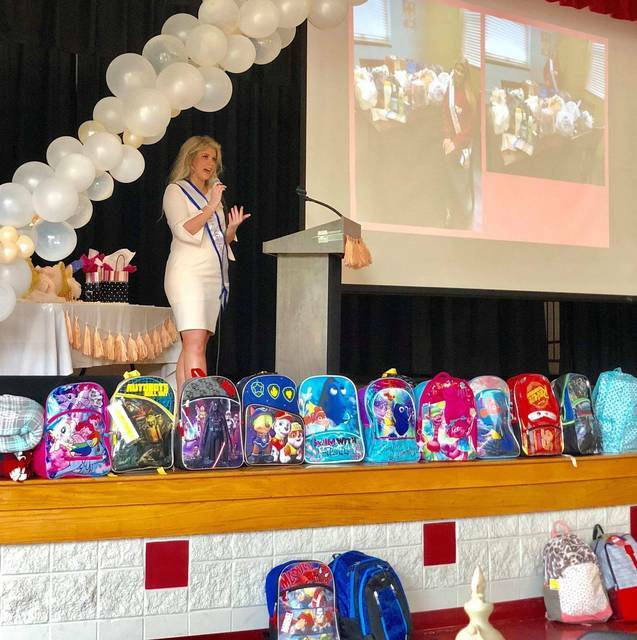 But, I wanted someone who had to go, to be at ease and get these things when they pick up the babies.” Downey will continue to collect backpacks and money through the summer, as it is such a passion for her. One of the more unique things that Downey did at her event, was she had each of the River Days’ Candidates, do something called ‘Art for a Cause.’ Downey says, ”Each of them got a canvas and each of them did a drawing of what they wanted to paint. They drew whatever they wanted on it and I, actually sent it to a company and they auctioned them off and all the proceeds went back to foster kids nation wide.” She said that she and her pageant mom found this activity on the internet and that Dr. Cynthia Hamm in Minford, sponsored this project and all the essentials it took, to carry it through. Downey spoke, “There were just a few other girls from Minford that ran for Miss Minford and each of them could have easily done a great job. At Minford, the kids vote and you actually did an interview like at River Days with adults, and I already knew what my platform would be if I was chosen.” Downey has been a varsity cheerleader for four years and also a varsity four year single player in tennis. “I started playing, when I was six.” Her freshman year, she played on the boys’ team, due to scheduling conflicts, but has since been on the girls’ team. She also belongs to the Bible Club, Spanish Club, Art Club, and the Math Club, until she began doing post-secondary education. Downey’s aspirations for her future is to major in early childhood education, following her mom’s footsteps and other family footsteps. She did say it is what she has been around all her life, but that after being in Judge Lemons’ court, being in law could be her second choice. She says that she has enjoyed doing the Miss River Days things, but that if you didn’t enjoy it, it would not be fun, because of all the things they do before the pageant and parade. She absolutely loves it. She has drawn the country theme for her float, and is calling it, “Nashville meets Minford.” And, she is dressing up like an older county singer.